In The Flash, debuting tonight at 8 p.m. ET/PT on The CW, Central City CSI Barry Allen is captivated above all else by one case -- the murder of his mother, which was wrongfully pinned on his father when he was a kid. While it's hard to fault him for obsessing a bit over an experience so traumatic, Allen's chosen venue for organizing his thoughts on the matter is that of a chaotic corkboard that looks like the wall of every movie serial killer. This isn't meant to throw suspicion on Barry, by the way: it's a device that Geoff Johns has used before. So much so that when I see it in other stories, I refer to it as the "Rip Hunter Chalkboard," named for the storytelling device Johns used in 52 and Booster Gold. This reporter is...well, a reporter. Created by J.T. Krul during his run on Green Arrow, Gibson is a reporter at the Star Gazette of Star City. Nobody I can find in the DC Comics Wiki, but this reporter is apparently named for someone who has done extras casting on projects like Fantastic Four and X-Files: Fight the Future. Ryan Doucette was a character (never pictured) who lived in Starling City on Arrow. His grave is seen at the start of Season Two, one of those mourned after the earthquake that ended Season One. The character's name is derived from a production assistant on the series. Here, he's apparently a child molester, so it seems he got some kind of karmic justice by being swept up in the earthquake...? 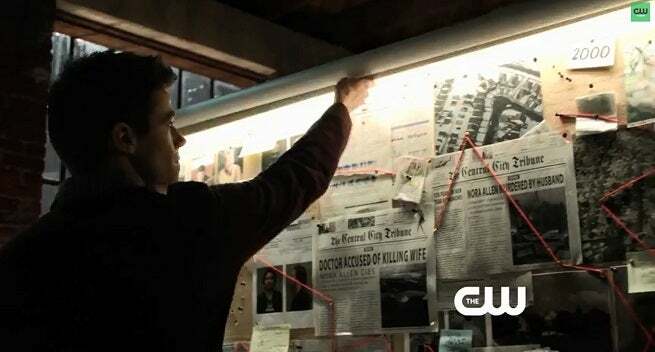 Whatever that place is, it's in Burnaby, British Columbia...which means that one of the receipts used as "evidence" in the case of Nora Allen's murder is likely just a practical receipt that somebody got locally where Arrow and The Flash are filmed. It's not clear who Cpl. I. Hutniak is, but Denise Hutniak was the name of a journalist whose article allowed Laurel to link Oliver Queen and the Arrow on the second season of Arrow, after having been told by Slade Wilson that the two were one and the same. Not all of her victims are memorable or recognizable, but names like Dave McClung have Helena "The Huntress" Bertinelli's name all over their cases. In McClung's case, it looks like he was hunting associates of the Huntress. It also looks like eventually she hunted him back...! The police that responded to the death of Nora Allen were the 52nd Division -- a reference to DC's "New 52" publishing line. There's nothing specific to give us reason to believe this, but since the show is shot in Canada, we started to assume that the publishing company behind these newspaper clippings is in fact named after retired hockey player Neil Hawryliw. Becuase why else use that name?! ...Well, because Kenneth Hawryliw is actually an Art Department member on projects like The X-Files, Caprica and, yes, Arrow. He's also named as a supervising officer in a Count Vertigo case. His subordinate, Det. J. Pate, is someone we cannot identify. This name on an arrest report is the name of an Art Department member on Caprica, Battlestar Galactica and Painkiller Jane. Here, she's wanted for Social Security fraud. If you look at any number of shows about odd phenomena, common thread is that the little kids in them are always drawing something that's key to the mystery but just cryptic enough to keep from being too helpful. Here, we have Barry's self-portrait of him throwing a chair into the "tornado" that killed his mom. Another reporter whose byline we see, "Ron Troupel" seems likely to be just Ron Troupe, a longtime Superman supporting cast member and Daily Planet journalist, but one whose rights they probably couldn't clear for a non-Superman production. Trevor Carabin, one of the camera operators on Fantastic Four: Rise of the Silver Surfer and Man of Steel, was apparently another one of The Huntress's victims. While now dead, he was in life a known lieutenant and messenger for her father, crime boss Frank Bertinelli who trafficked in, among other things, the Vertigo drug. No idea who this person is (he's got a photo with his name handwritten on it), but there is such a person in Vancouver, BC, according to Canada 411. So it's probably a crew member or a friend. Check out the gallery below! And check back later for much, much more on The Flash!